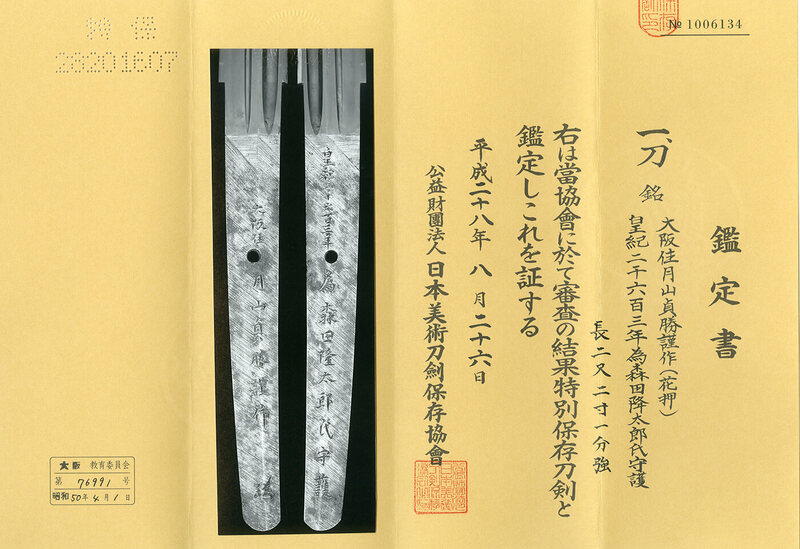 Explanation: This blade was made for Mr. Morita Ryutaro in 1943. Habaki : Silver single Gassan Habaki. Sori :2.2 cm or 0.86 inches. Shape : Wide and thick, Mitsu Mune style Katana. There are Bo-Hi and Soe-Hi on both side of the blade. Hamon : Nie Deki, Gunome Midare. In Ha, there are fine Kinsuji. popularly known as Living National Treasures. Sadakatsu passed away in 1943, aged 74. Saya : Black and reddish brown Saya with gold Nashiji. Tsuba : Round shape iron Tsuba, wave design is engraved with gold color. Menuki : Large size Shakudo Menuki, plants and birds are engraved with gold color. Shakudo Nanako, birds are engraved with gold color. This blade belongs to Jyo　jyo saku ranking. Blade length : 54.0 cm or 21.25 inches. Width at the hamachi : 3.17 cm or 1.24 inches. Era : Edo period, around Shotoku era (1711-1715). Shape : Wide and thick blade with Sori. Nice shape Katana. This is beautiful Yamashiro’s Jigane. Special feature : Oumi kami Hisamichi is a student of second generation Iga no kami Kinmichi. of becoming one of 5 selective Kyoto sword smith. at the same year he has changed his post to Oumi no kami. Some of his works include Kikumon of 16 petals while he has also engraved Kiku-mon with branches. There were no branch Kiku-mon used for Enpo 8th Year Augustj. 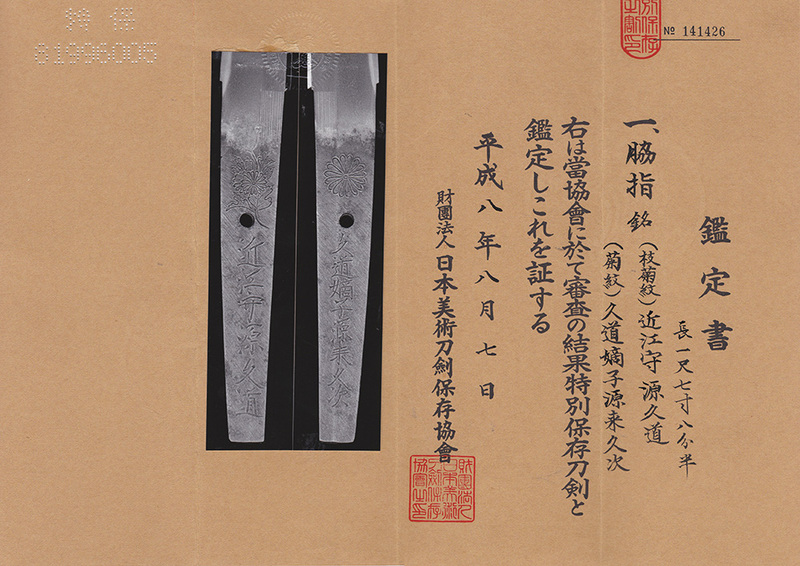 He was allowed to use the signature of Second generation Igano kami Kinmichi MIshina signature. On the nakago, there is branch crest engraved. At the time it was quite new to have chrysanthemum　Eda(branch) Kiku-mon. First generaiton Oumi kami Kisamchi was called Hori Rokurobe. He was a student of second generation Kinmichi and was called One of the Big five Kyoto Sword Smith. At Kanbun 1st year he has received the post of Oumi Daijo. At same here when he has changed to Oumi kami, he has passed away at the age of 85. Fuchikashira : Shakudo Nanako, morning glory is engraved with gold color. Menuki : Shakudo, Kirin(Chinese myterious creature) is engraved. Kozuka : Shibuichi plate, wave design is engraved with gold color. From Aoi Art: It is very rare that the Daisho of Gassan Sadakatsu and Hisamichi, Hisatsugu. The Koshirae is also very beautiful. We strongly recommend this item for you. NBTHK Tokubetsu Hozon Paper for each blade.